July | 2012 | what? bread? The Offspring was moaning of course that he doesn’t like ‘healthy bread’ aka my 50:50 wholemeal and white as discussed previously, but only ‘exotic bread like baguettes and flat bread’. I have a Hairy Biker’s recipe for baguettes that takes 36 hours so that’s going to have to wait for a less hectic time for me to have a run up at it, but Dan Lepard has an easy peasy tortilla recipe that doesn’t take forever to make. You’ll find it in Short and Sweet and it makes 5 or 6. Ingredients are plain flour, baking powder, salt, milk or water, boiling water, corn or sunflower oil. I used milk and sunflower oil for the things where there was a choice. Easy enough to make, mix the dry goods, then mix the wet goods separately, add together, leave for 10 mins, knead briefly, leave for an hour or so, divide up, roll out and then just before frying in a hot dry frying pan, roll them out a bit more. Like making pancakes you live and learn with this, so the first one or two in the pictures below came out a bit thick, and I rolled the next ones a bit more thinly. Delicious warm with ham in and juicily slobbery with jam! I would definitely do these again and they don’t come out all pappy and chewy like shop-bought flat breads. The Offspring also managed to eat two of them, so I reckon that was pretty successful. Dan says you can freeze them. I had two leftover and have kept them overnight in a plastic bag in the bread bin. I think they were left out a bit too long in the tea-towel yesterday as we rushed off out in the evening and were a tad dry today. Just a few lines to say, in the immortal words of Granny Weatherwax “I ATE’NT DEAD”, and like Granny Weatherwax, I’ve been busy, mostly watching Le Tour for the last three weeks, not having out of body experiences, and baking has taken a bit of a back seat. Sorry guys but the choices for the Mellow Bakers for July didn’t fill me with excitement, two loaves with grains and I don’t have much luck with loaves with grains so not looking foward to making more bricks and something with lard in the title. I have a stash of frozen bits of rice that need using up so perhaps they can go for the five grain one. Although having looked at what some of the others have come up with, I’m still not enthused. But anything with leaven in is going to have to wait as mine went green and furry and I’ll have to start again. Other members of the household find sourdough a bit hard going because they have to use their jaw muscles to chew it and it doesn’t slip down without chewing (mine anyway). I like the chewiness as it slows down eating and that can sometimes be a good thing, slow food movement and chewing slowly so you feel full up before you’ve eaten too much and all that. And it makes fab toast! Lard bread, no, still not excited about that. Doesn’t feel very summary now that summer’s here at last. And it has got lard in it, not one of my favorite fats. I’ll happily use any amount of butter, but lard, ew! Being a part-timer, now that I’m on school hols with the offspring perhaps I’ll get some experimental baking done sometime soon. However, I am still making our daily bread, mostly with the sponge being left to rise for a variable number of hours and then squeezing in other things while it is rising. My latest cunning plan is to multiply by 2.5 the amount of ingredients for Dan’s white farmhouse tin loaf in Short and Sweet, and using wholemeal for the flour added to the dough to make two decent sized large loaves. On a school day I start off the sponge in the morning, then add the other flour and ingredients when we get home at about 3.30, or sometimes at 3.00 when I touch down before school pick up and then do various kneading episodes before leaving the dough to rise while I make dinner, or go for a run, or do something else. Or I start the sponge overnight, then after the kneading episodes go for a run while it is rising in the morning. Or even as yesterday, double hand it with making pizza and by the time I’d finished baking the last pizza the bread was ready to go in. I sometimes have a fleet of Ikea Stam timers on the go next to different bowls all running different schedules, and the kitchen goes mad with the ticking. Also now that the holidays are here I hope to get around to making some pies from Short and Sweet. Husband likes pies and pastry is something I don’t make often because I don’t like it much – too much fat in it and I generally don’t eat it on shop bought pies unless it’s nice and crispy, and soggy pie bottoms go out in the ‘green’ recycling bin. No baking today, a very long day started before 5.00am when one of the cats decided to jump on me to express his gratitude at being a cat and not a human, I got up before 6.00 ‘cos the boy woke up, had some breakfast, read a bit, went for a 12 mile run, showered, read some more, cooked lunch and jumped on bikes to go out and about. 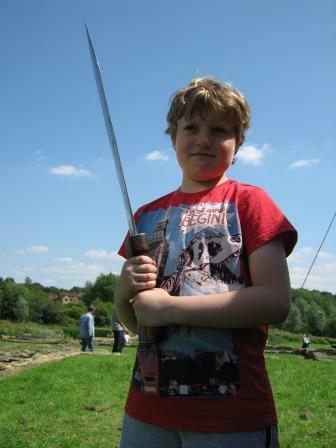 We visited the Romans at Bancroft Villa where helmets were tried on and swords waved. Oddly I don’t remember there being Roman soldiers on the villa when we excavated it back in the 1980s. Then we headed up to Cosgrove to touch base with the canal festival, and the Iron Trunk, then pedalled home, a round trip of 14 and a bit miles, to watch Le Tour and Wiggo winning the yellow jumper, and Cav taking his fourth Paris win. Boy got a bit toasted and has nodded off like a good’un tonight – result! It’s coming to the end of the school year and making cakes for charity seems to be the order of the day. Now I don’t mind this as a fundraiser, so long as they don’t charge less than it costs me to make them. Last month, school had a Father’s Day Fayre which demanded baking, so I produced some of Dan Lepard’s gingerbread wafers, some of the Hairy Biker’s lemon and cardomon cookies and a batch of Bake Off Chocolate Crackles (which every man and his dog who blogs about baking seems to have made, so I won’t give you a link – they all put the recipe up if you care to Google, which, obviously I don’t). Two of each in a bag with a nice label, bingo. Actually the other thing I object to is the mummies that supply a box of stuff baked by the local Co-op convenience store, still in the box so I know you didn’t make it. Really my dears if you can’t do it, or don’t know how, let those of us who do and can get on with the job! 125g soft unsalted butter, 125g caster sugar, 2tbsp condensed milk, 175g self-raising flour, 100g white choc in chunks, 40g dried cranberries. Cream the butter and sugar, beat in the condensed milk, work in the flour, then the chocolate and cranberries. Divide into 50g blobs for big ones, 25 g for small ones, flatten a bit (12 or 24 cookies). Bake at 150C for 25 mins. A tin of condensed milk goes a long way, and I have found the wretched stuff doesn’t freeze, but can at least be kept in icecube trays in the freezer. A very useful recipe if you’ve got no eggs but need some cookies or something sweet. For home baking we have also had cake, and another recipe that uses the condensed milk. Dan’s Brown sugar chocolate cake from Short and Sweet. There’s a version from 2005 on the Gruniad website, but the Short and Sweet version is slightly different. Having had a quick browse today I see that some people have found the Short and Sweet version challenging but I found it easy and it came out looking like it should. And after all that description and no pics, here’s two of the one that I made. Being a bit old school I am often sceptical of cakes that move too far away from a basic fat, sugar, flour and flavouring mix, and this one does have some faffing about with melting dark chocolate, adding water, and glycerine(! ), and I’ve had some bad experiences with the Hummingbird cake book, sadly for my readers not during the life of this blog, maybe I’ll go back there and we can relive those horrors. Anyway, all was good with that one. I diverted from Dan’s frosting suggestion and just bashed up some butter, icing sugar and cocoa. A marmalade cake from the Bake Off Book. You can Google the recipe if you want, other’s have reproduced it and it’s not for me to do that for you here. I am pleased with the outcome, and also pleased that I used eggs provided by one of my work colleagues who keeps a few chickens. I don’t know what she feeds them on but the yolks always come out very yellow and that helps to colour the sponge nicely. A simple butter sponge with spoons of home made marmalade stirred into it, topped with more marmalade and some icing. And I’ve made some strawberry jam, despite haranguing Olly over on http://breadandbikes.wordpress.com/2012/07/07/bread-maker-jam/ about his use of the breadmachine to make jam. Boys and toys! Me, I used a saucepan and a wooden spoon. And finally she gets a small loaf of 50:50 white and einkorn bread. No pics of that, it’s a small brown loaf! But the trick with that one has been to use Dan’s white bread sponge method over night to get the yeast going in the white flour, add the einkorn this morning, do the kneading stuff and then once it’s in the pans rising, go for a run. Eight miles and a bit – and being an idiot going along the route of the MK HM but thankfully off the course before they passed by, and the loaves are ready for the oven. My oven has an auto timer thing so I can decide when it comes on so it is ready for when I get back. Flour, slash and steam. In they go, 20 mins at 240C while I have a shower, turn down the oven and another 25 mins. Right that’s me done for, only the lunch to finish cooking and then I’m done. Off to track the Tour de France (go Wiggins – a man who could do with a bit of cake IMHO) next and not watching Wimbledon (Roger Federer looking for his 8th title, no chance Murray), or Silverstone (makes me fall asleep and I’ve had enough of the helicopters going too and fro already today).